An MG 18hp SA saloon bought at Cass's Motor Mart, November 1936. Homepage. 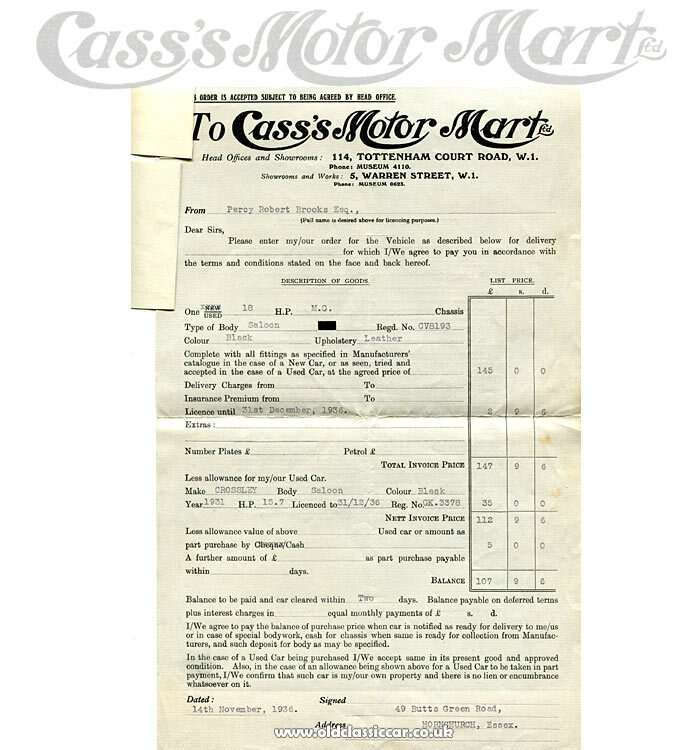 This page: Part-exchange of a Crossley car for a sporting MG 18hp saloon in 1936. Cass's Motor Mart of London. Mr Percy Brooks regularly changed cars during the 1930s. In 1935 he purchased a Crossley 15.7 at the Manor Motor Company, and the next year drove over to Cass's Motor Mart on the Tottenham Court Road in London W1, and part-exchanged said vehicle for a black MG 18hp saloon. The MG's registration was CV 8193, a Cornwall series first used in July 1934. An allowance of thirty five pounds was made for the black Crossley saloon against the MG. This typewritten invoice records the transaction, and also gives a few details as to the selling company. Cass's Motor Mart Ltd had its head offices and showrooms at 114 Tottenham Court Road, and further showrooms and a workshop at 5 Warren Street, also in W1. The contact telephone numbers were MUSEUM 4110 and 0623 respectively. Sources elsewhere suggest that the firm was established back in 1911. In an archive of the London Gazette it records the fact that the company went into liquidation in May/June 1940, following notice of the intention to wind up the business voluntarily being given in the 22nd December 1939 issue of the same publication. E.R. Cass was the garage's Chairman. The car referred to is simply given as an 18hp saloon, which most likely makes it an example of the MG SA, a car that initially had a 16hp rated engine, before being enlarged to make it an "18". Coincidentally, in 1939 he part-exchanged a different 18hp MG for a Riley 9 Lynx tourer, which he found on sale at Motor Mart Ltd in London W1.